Political Satire: What is Fascism? This article is addressed to all people in America, but particularly to those of us who supported Donald Trump for president. The polarization of the two Party system into cultural opposites has created a crisis of confidence in the U.S. Government that is without parallel in history. Lies dominate both sides of the political fence. And history itself and what used to be consideed facts have been rewritten and charges of "Fake News" are hurled by those who themselves are responsible for "Fake News." If things continue along the same course, the days of war in the streets and fascism will be upon us. The two opposing sides may have some important things and interests in common, but idelogically they cannot communicate with each other, the belief and fact systems are simply two far apart. We now have a president who has gone against both the Congress, even though it is held by his own Party, and about 60 - 65% of the country. The other 30 - 35% love and follow him without question or criticism. He once said, and it may be one of the few honest statements he has made: "I could shoot someone on Fifth Avenue in New York, and they would still support me." A statement not understood, apparently by many of his supporters and even by President Trump, as many read it as an arrogant and conceited boast, and as an insult to the intelligence of his supporters. 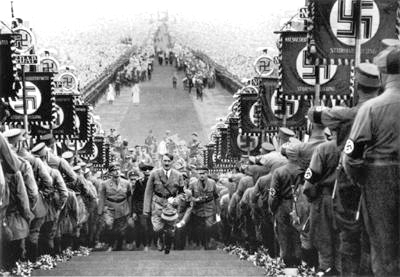 In Germany, Italy, and Japan during the 1930s, we saw the rise of similar authoritarian governments, that violently supressed opposition and democracy, and started a World War which took the lives of 60 million people and 250,000 Americans. Our fathers and grandfathers fought the fascists in Europe, and now they threaten us in America. This was a 1947 United States Defense Department film warning about fascists within our own country. Perhaps a bit dated, but it still rings true today. If you don't have the patience to read this article, I instead ask you to view this short film (click video to the right). It's words may also sound strangely familar to you. Or read on and listen later. Some opponets of President Trump have argued that he himself is a fascist, to the anger and frustration of many of his supporters. When you watch the short video, you will recognize that fear of "the other" also dominates Trump's politics. The "other" being Mexicans, Muslims, Hispanics, and last but not least, the white fear and mistrust of Blacks. In you are a supporter of Mr. Trump, ask yourself, why did he conduct his "birther" movement for five years, all the time claiming that Obama was not an American, and was not born in the U.S.? He made Obama, falsely, into an "other" because he was black. Now I myself also had plenty of criticisms of Obama, but they did not center around the false charges that he was not an American. This was classic racial recruiting, giving those that disliked him just because he looks black (his mother was a white woman from Kansas) a reason to hate him. He eventually gave a five second barely audible "apology" for 5 years of slander, and refused to answer questions as to what happened to the "positive proof" he claimed he had. It is no accident that today, many in groups like the Klan and the Nazis, support him. I ask Trump supporters to consider how come and where his movement is headed. And what he actually means when he says he will "Make America great again.?" Is he acting in the best interests of the country, or his own selfish ones? professionally played by both Parties." Clearly, President Trump has tremendous power, yet that power is not absolute, and he has so far been hampered by his political opponents as well as, to a lesser degree, by his own Party. Make no mistake about it, however, he is no Republican. When it suited him in New York, he was active in Democratic Party politics. He supported gay rights, abortions, and many other Democratic Party platform issues. He, however, has no understanding of democratic government or respect for it, which in America was founded on the theory of three independent co-equal branches, the Congress, the Judiciary, and the President. The founding fathers, though far from perfect, knew well the dangers posed by dictatorial kings in Europe. They wanted a president to have power, but they wanted it checked and balanced by the other branches of government. Mr. Trump has undeniably revealed his disdain for anything that checks his power. This is an indisputable fact, not fake news. He represent a wannabe dictatorial figure with a large following of uncritical supporters. He has no power without them. Study your history, and you will see that every dictator in the modern era has led their country into disaster. Absolute power corrupts absolutely. And I say this knowing that in general, there is a level of corruption in both parties, and lies are common. But give Trump the power he wants, and his ignorance and incompetence will lead to certain failure and eventual destruction. His narcisism, arrogance, and ruthlessness is sadly part of his appeal to some, but this apprentice T.V. character running our country is a disaster waiting to happen. Trump has recruited for his cabinet generously from the ranks of organized white supremacy groups as well as individuals, and has drawn support from violent ones like the Klan and the American Nazis. 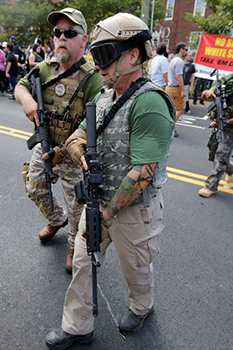 Some of these demonstrators carried automatic assault rifles. 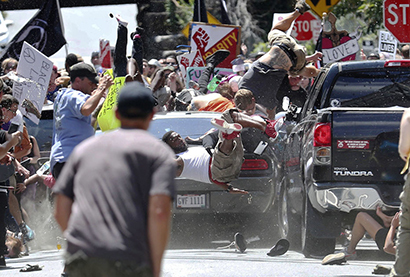 Because he actively sought the support of white supremacists, Trump had a difficult time condemning these far right protestors by name for the recent automobile terrorist attack by one of their sympathizers. They came to Charlottesville with shields, knives, guns, pepper spray, and helmets. 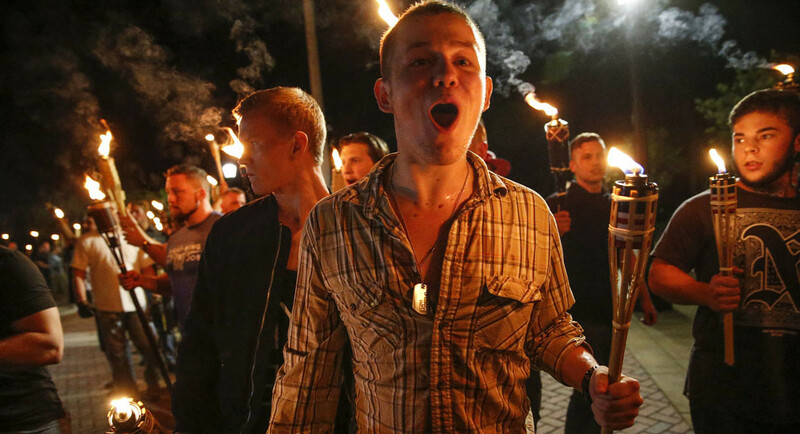 They marched at night in this peaceful college town with torches reminiscent of Hitler's thugs marching against German Jews in 1930s chanting anti-Jewish slogans. In America, Black people also serve as our "Jews" to them. While they have been here longer than most groups that came as immigrants, Blacks of course were brought here as slaves, and were bought and sold as cattle. And killed legally and had no more rights that a farm animal. Yet even to this day, hundreds of years later, they remain both unequal and marginalized. Even though he becames president, Obama was still a (N word) to many Americans. So to be more specific, what exactly is white supremacy and how does it differ from racism? It is best defined as a surviving belief left over and inherited from the slave owners that Blacks were inferior genetically and spiritually, and should always be ruled over and controlled by whites. It is a belief that this is a white, European ancestry run country in which racial minorities should serve white interests. While related of course to white supremacy, racism is not exactly the same thing. One can express dislike or prejudices towards a different ethnic group, whatever that group might be, without also subscribing to white supremacist views. And you can be of any skin color or from any ethnic group and be racist in your attitudes. This is an undeniable reality. Few are without such faults. White supremacy, however, has it roots in America itself. It was part of the fabrick of America in the form of slavery before and after Thomas Jefferson wrote the Declaration of Independence from England. It took a bloody war to abolish it, but it's aftermath still remains to some degree in our economy and institutions. and to a greater or lesser extent, in the hearts and minds of many Americans. It remain in the statues of Confederate Generals, as the horrors and inhumanity of slavery were rewritten and romanticized. These generals took up arms against our government because they felt their slave interests were threatened, and the monuments were mostly erected fifty years after the war, and are viewed by Black Americans as symbols of terror, not heroes. Americans still live in two separate worlds, one black, and one white. These worlds are both material and psychological. We can look at the same things very diffferently. We often do not understand problems in the same way. We can have stereotyped views of each other, and often make erroneous assumptions based on those stereotypes. A timely example of this is the way some white folks view the "Black Lives Matter" group and slogan. These indivuals believe that the slogan means that white lives do not matter, or matters less. It a classic example of why some whites, driven by racial antagonism, misunderstand the meaning and roots of the slogan. While whites and blacks certainly have some common interests, the racial tensions and mistrusts that exist often prevent any joint struggles from taking place. The politicians in both Parties are well aware of this, and never cease to expolit the fears and mistrusts we have. At one time, the dominant political party in the South was the Democratic Party, which included the segregationist policies that whites should control but be separate from blacks. Likewise, the Republican Party was once the Party of President Lincoln, and opposed slavery. Today, the Democratic Party welcomes and pursues black voters, and purports to have their best interests at heart. And the Republican Party gets few black votes and persues white supremacist voters. Both manipulate voters based on attitudes towards race. than on developing much needed tax paying jobs." Despite it being 160 years after the Civil War, which was fought to end slavery, the racial divide in this country remains. There seems to be an attitude by the politicians either than the problems no longer exist, or that solving things be damned. One result of this are racial tensions and mutual antagonism. 70 years after the Civil War (1930s) Blacks were still being lynched in the South. To this very day, the average white person has more that 2 to 3 times the wealth of Black Americans. The poorest neighborhoods and the most extreme poverty is reserved for Blacks and Native Americans on the Reservation. For a time there was some attention being paid to this problem, but not lately and not today. Any attempt to raise issues of racial equality are usually countered with "you want special treatment" or "you are playing the race card" or accusations of "reverse discrimination." Through all this white poverty still exists, and numerically at least, a bigger problem than Black poverty. When Martin Luther King was assassinated, he was working on a poor people's campaign and a march on Washington. It wisely included both whites and blacks. All of which leads me to something you may not have considered. and that is, while many whites believe they pay no price for both poverty and racism, it is not fake news to report the tremendous cost that is disproportionally paid by working and middle class tax payers, both black and white, because the intractable problems of poverty and race have not been addressed. How can this be? Well in America there are nearly 3 million in the prison systems, and many more than that in the parole system. It costs, for example, nearly $71,000 dollars in California and $168,000 in New York for each prisoner when you include all the related expenses, a catastropic amount in taxes that YOU pay.Then there is the budget breaking cost of maintaining larger numbers of police, and the cost of paying DAs and prosecutors, judges and other court personal in the criminal justice system. And the nearly three million in prison rarely are successfully "reformed", and after time served are typically sent back to the same environment that got them into trouble or hooked on drugs in the first place. And while in prison they pay no taxes. No one in politics in either Party will raise this issue. Wouldn't having a real plan and policy to create tax paying jobs and end poverty make sense and actually save resources and money? The problems triggered largely by poverty and unemployment cost many times more than the jobs and materials needed to fund critical infrastructure improvements. Do the math if you doubt this. 1 A leader that seeks ultimate, singular control and power over all of government and its policies. One who believes that only he can make important decisions, set policies, etc. One who never admits faults or apologizes. He shows contempt for perceived weaknesses of others, and retaliates ruthlessly against those he considers rivals or enemies. 2 In addition to #1, this leader must have many loyal and unquestioning followers, willing to do battle for him, and who will follow him more or less blindly and no matter what is revealed about him. This is essential to any fascist movement, as without considerable support there is no fascist movement. 3 He must successfully divide his opposition and also the general population. The various prejudices in America are a good starting point. Racism being the number one ingredient in America. He wants his followers to love him and hate everyone else. Any group that does not endorse him is considered to be an "other", someone who is not an American. 4 Fear and Anger are essential. When we are driven by these emotions, we may not think or see things logically. 5 A Crisis. This means a time when he can excuse the suspension of normal laws and rules. It is then that such a leader can eliminate or neutralize his enemies. 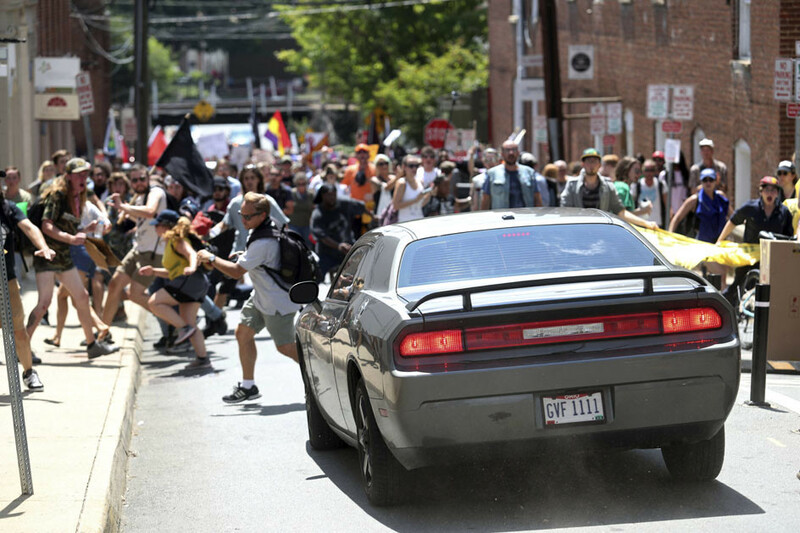 What Charlottesville demonstrated was a logical development in the type of cabinet President Trump created, one heavily influenced by white nationalists which he appointed to his cabinet. This emboldened groups like the Klan and the Nazis to march ruthlessly on this peaceful town. They are reportedly planning other such marches, which are virtually guaranteed to set off a degree of trouble. When decent, fairminded Americans seek to demonstrate against them, the President has equated them as equally responsible for any violence that might occur. To conclude, the President does seem to generally fit into these five categories. If you do not see some of these traits in common with him, you might think again. I am no member of the Democratic Party or worshiper of Hillary. I had legitimate, non-racial criticisms of Obama. There are also millions of Americans like me. We must not be at war with each other because of the behavior of opportunist politicians and serial liars. followers, willing to do battle for him. Admittedly not on topic, but I mention this as it's indisputably NOT fake news, and helps expose the true nature of the Republicans in Congress and the Trump administration. You are no doubt aware of the failure of the Republican led Senate to pass the health care bill they sponsored, and to destroy Obama Care. as the president had promised. There were nation-wide protests by tens of thousands of Americans, from both parties. who demonstrated and stormed the headquarters of many Republican Senators. If you took the time, like they did, to actually learn what the bill did, and did not do, you would have to admit that it was a terrible bill for the average American. It was supported vigorously by President Trump, who went as far as to make this top on the list of campaign promises. I respectfully ask his supporters in light of how bad this bill was (15 to 20 million would lose insurance if it passed)to ask themselves this question. How can you expect this spoiled and pampered billionaire to do anything of an economic nature that would help you beyond throwing you a few crumbs? Isn't it time for us to pressure BOTH Parties for single payer universal coverage for ALL Americans who want it.